The Hydraid BioSand household water filter is a lightweight, portable biosand filter intended for point-of-use water filtration and can provide clean water for a family of eight to ten people. Dr. David Manz, who pioneered the concrete biosand filter also developed and patented the plastic Hydraid biosand filter after experiencing the more heavy and cumbersome concrete filters. The Hydraid BioSand Household Water Filter, just like the concrete filters, consists of layers of sand and gravel. A biological surface layer is developed that consumes disease-causing pathogens found in source water and begins a process of pathogen removal that is continued during the pause period of biosand filter operation. Hydraid filters are made of plastic, are lightweight, and have no moving parts. Uncean source water is poured into the top of the Hydraid filter. A diffuser plate helps to gently distribute the water over the surface of the sand media. A biological layer at the top of the sand contains “friendly” bacteria that consume pathogenic organisms that are present in the water. As the water makes its way through the sand column, further disinfection of the water takes place through the actions of mechanical trapping, predation, adsorption, and natural death. 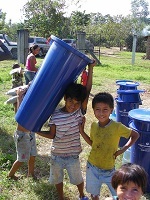 Clean water collects at the bottom of the filter and flows by gravity out of the filter through plastic piping attached to the filter’s exterior. A properly operating and maintained Hydraid Biosand Filter can provide up to 48 liters of clean water per hour. When you purchase a Hydraid filter, you also get three bags of sand media material that is cleaned, sifted, premeasured and ready to install in the filter. The inclusion of the sand filtering media means there is no need to sift, sort, or clean sand for the filter. This makes the setup of the biosand filter much easier than if you did not have sand provided to you. Setup, installation, and maintenance instructions come with each filter. As with all biosand filters, careful assembly, placement, and monitoring is important to assure that you are, indeed, getting clean safe water from your biosand filter. Filters should be checked for proper filter flow rate, any possible leaking of PVC pipes and joints, and cleanliness of the water reservoir, diffuser plate, outlet tube, and water storage container. With reasonable care a Hydraid Biosand Filter can last for 8 or more years. Return to "Intro. 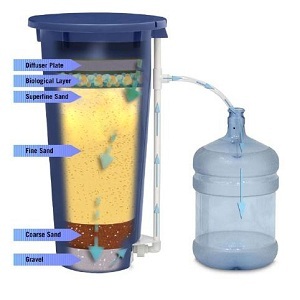 to Biosand Filters" from "Household Water Filter"